It’s likely that over the past few months, you’ve enjoyed a good selection of winter root vegetables. They’re brilliant for soups and they’re iconic accompaniments for our Christmas dinners. As the seasons for those foods draws to and end, we can start to look towards so slightly different vegetables as spring approaches – not that it feels like it at the moment! 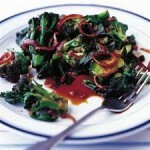 Over the coming weeks head out and enjoy the slightly bitter and tangy veg that is a superfood and destined to brighten up any dinner plate: purple sprouting broccoli. It’s delicious either cooked or raw! As it’s one of the first of the year’s brassicas to grace our plates, purple sprouting is usually top of the list for top chefs who’re champing at the bit to turn their backs on parsnips, swede and turnips and bring a spring-like freshness to their dishes. And, who can blame them? Not only does it look very pretty, but it also tastes mighty fine! 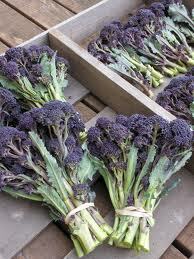 But it’s not just purple sprouting we have to look forward to, as brassica season gets underway, it won’t be too long a wait before we can enjoy Tenderstem, Belleverde and good-old fashioned broccoli in all it’s short-stemmed glory. And, it’s not just flavour it’ll bring to your mealtimes, but a whole host of health benefits too! Broccoli’s noteworthy nutrients include vitamin C, vitamin A (mostly as beta-carotene), folic acid, calcium, and fibre, which has hailed it as one of nature’s miracle vegetables! For the freshest broccoli, often cheaper than the supermarket, pay a visit to your local greengrocer or farm shop. To find your nearest have a quick search on our local food map here. If you have a favourite broccoli recipe that you’d like to share, or any other recipe, please video your recipe and add it to KIS (Keep it Simple) Cookery. Please have a look at existing videos here and try and keep your video less than 2 minutes long.